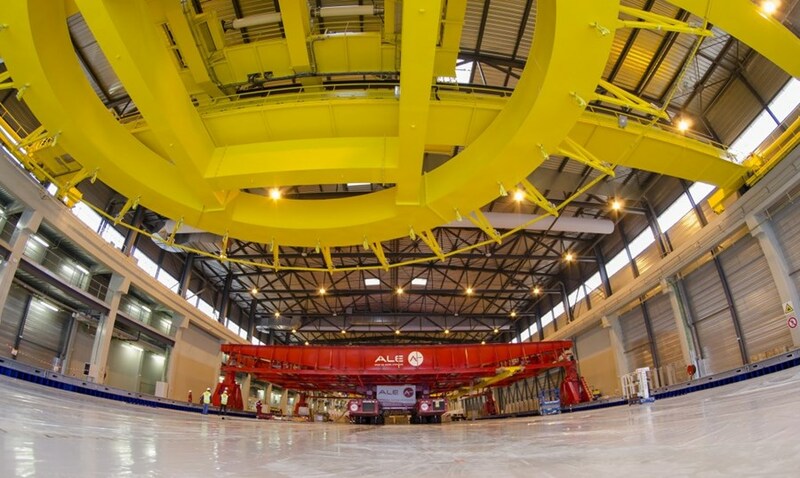 It's big, round and red and represents the latest addition to the collection of cranes operating on the ITER construction site. Together, hydraulic towers and circular beam will form a 30-metre-in-diameter gantry crane. The next phase will consist in installing the crane's electrical wiring, completing the commissionning, and executing the site acceptance tests. On Friday 8 December, two powerful mobile platforms slid under the 360-tonne circular beam, lifted it a few metres, and drove it slowly into the Poloidal Field Coils Winding Facility. At the northern end of the building, four hydraulic towers, sitting on rails, were waiting for their load. Together, towers and beam will form a 30-metre-in-diameter gantry crane, travelling on rails and capable of handling, in a perfectly balanced manner, the heaviest of the ring-shaped coils throughout the last stages of fabrication. The yellow spreader beam in the foreground, with a lifting capacity of 40 tonnes, will handle the individual ''double pancakes.'' Once the double pancakes are assembled into a coil, they will be manipulated throughout the last stages of fabrication by the red gantry crane. The crane was designed and manufactured by the Spanish company ALE Heavylift, with the steel structure produced near Madrid and the hydraulic and electrical parts in the Netherlands. 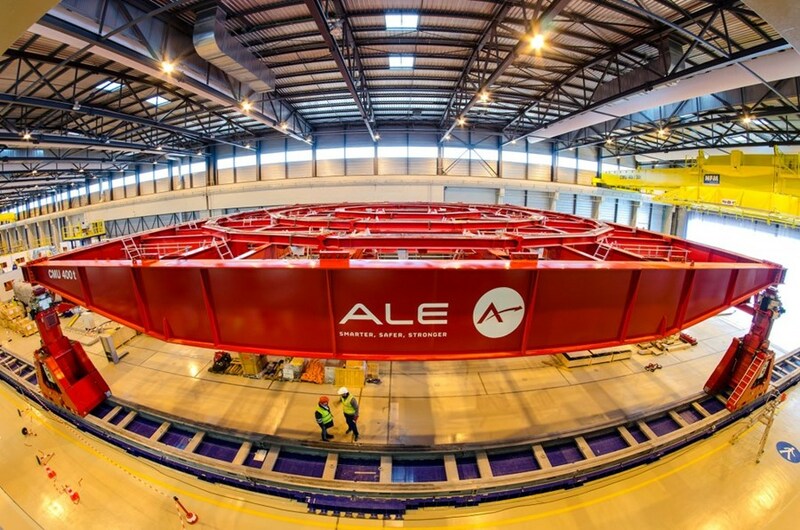 Approximately six months of work were necessary to assemble the beams from the first crane components delivered to the ITER site in June, and to install the rails and the hydraulic towers inside the building.